Mo Farah! The double European track gold medallist. Take a bow slim. Once upon a time there was a runner named Mo. He got down to some training, got some good results and promptly had the expectations of the UK running community placed on his shoulders as reward. 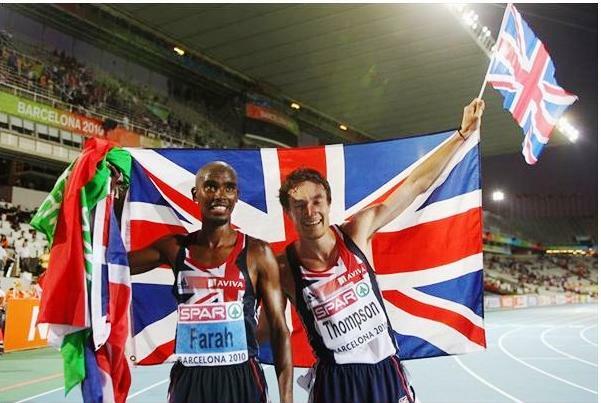 Thank heavens Chris Thompson, with his own triumph-to-tragedy-to-triumph story, has joined the party this year and made sure Mo is not the only Brit under 28 minutes in 2009/2010. Which is a ridiculous situation to be in, but there you go. So with Chris T in tow, and lets not forget, more than just in tow really, looming large on the 10k in particular: less than two seconds separated their season’s bests when they hit the European champs. 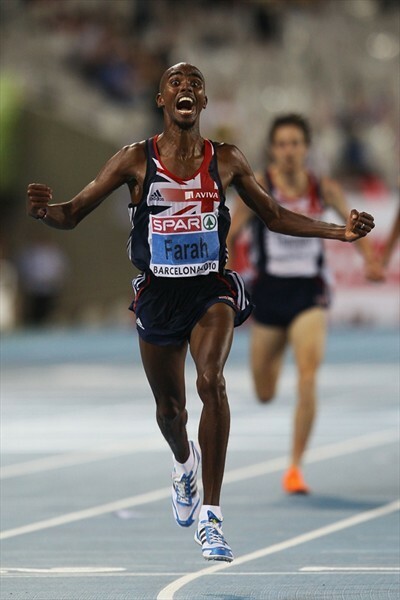 It may have provided Mo with just what he needed, consciously or subconsciously, to produce his best. Having someone sneak up behind in may have spurred him on as the season unfolded, or it may just have been the camaraderie of having someone else as a medal contender when they faced Europe’s finest in Barcelona. Either way the 10k on the opening evening of the champs was a fairytale race that developed (almost) exactly according to the script. As the top two in Europe this year, Mo and Chris were always going to have big parts in setting up the race shape. They have two very different strengths however and therein lay the catalyst for a good race. If Mo had his way, a final lap burn-up would have suited him fine (this is the 10k mind, we’ll get to the 5 another time, where perhaps his kick is not the showstopper it is at this distance). For Chris, burn-ups were not the ticket. He would have wanted a good, (“honest” is the word sometimes used to describe this, nobody likes a dishonest race after all, whatever that is) hard race, at a tempo that would get rid of any pretenders hoping for a super-slow-big-kick race to be on the menu. So with the pesky first half of the race out of the way, Chris made his move. Stretching the pack with around 10 laps to go. It sparked Mo into action and he got right into the flow, settling in amongst the top few as the pack thinned. Then with about 8 laps to go the script looked to be wobbling before going downright awry, with Mo no longer able to resist the urge to get the hell out of dodge and power on, and off he went. Once he got to the front he had no option really, but to pick it up. He wanted to go and his superior conditioning/ability meant that it was a fairly brutal move for the rest of the pack to try and cover. Obviously they did try and cover it. There was no way they could let the pre-race favourite disappear without a fight. So in this covering response from the chase pack, it became clear that Chris was actually pretty close to his limit and was exposed ever so slightly by not responding immediately and strongly. So Mo and his Spanish shoulder buddy, Ayad Lamdassam, pulled away strongly, leaving Chris to head up the chase pack looking for the final medal. This was worrying in that Chris was not on his own and could be swallowed by the bunch forming quietly on his shoulder when the bell went and the bronze was there for the taking. Two things were happening up front whilst (while?) this was going on. Firstly, Mo was not able to shake Lamdassam, and secondly he was aware that his move had put Chris into some difficulty. So, attempting to kill two birds with one stone, namely he needed to get the pesky Spaniard off his shoulder and out in front of him where he could keep an eye on him and time his unleashing of “mo’s monster” (when it came to final lap time) perfectly, and he also needed to try and slow the pace down enough for Chris to get back into the race. For this to come off, Lamdassan had to take the bait (and the lead) when Mo slowed and stepped into lane two. Surely not? An experienced international campaigner would call this desperate bluff for what it was and tell Mo to get the hell on with it? But amazingly Lamdassam bought it hook line and sinker. So as he scuttled unwillingly past Mo, into the lead, Mo looked back and gestured to Chris to come up and join them at the fast kids party. Obviously Chris didn’t have the legs for this; if he did he would have covered the move in the first place. Still, it may have given him encouragement to see his team mate pulling for him midrace. Chivalry done, Mo then got down to the business of sitting and kicking. The unlucky Spaniard really had no chance, stuck out to dry in the lead, waiting for the inevitable. And when it was delivered it was with the finality and confident drive of a runner who knows he will not only avoid being passed again this race, but was about to put some serious daylight between himself and the second placer in the space of just a lap. Oh to be a kicker. Ask Geb if he found it a useful tool on the track. Or indeed pose the same question to the legend Paul Tergat. His impressive CV would be ratcheted up a few notches, had he even half the kick of his perennial rival Geb. So Mo stretched seemingly effortlessly away to the gold, Chris got down to the business of holding off his own pesky cling-on, the Italian Daniele Meucci for the bronze medal. As they pushed each other harder and faster around the bell lap, the Mo-broken Lamdassam came into view. Could they catch him? Suddenly the race for bronze was a race for silver. Chris snatched it by the smallest of margins; he and Meucci were given exactly the same time. It was inches. So a British one-two in an event that has never previously had a British champion. What a race. And it got good exposure on the national news reports, turning distance running (albeit momentarily), into coffee machine and water fountain conversation usually reserved for ball-based sporting endeavours. “Wasn’t that Mo Farah splendid?” “He was toying with the field“ etc etc. There was even some talk of Olympic glory come 2012. Hush now, let’s enjoy the medals he has won. Wining hardware in a global championship is a LOT harder. The cream if Europe he certainly is, but there are probably a dozen Kenyans and a dozen Ethiopians (and at least one Eritrean) who could take care of business, and Mo along the way, over 10k. Let’s see Mo consolidate this outstanding championship performance with some world class performances in what remains of this year’s Diamond League meetings. A Sub-13 this season or next would go an awfully long way in turning him into a global contender. A 12-something guy, with proven championship BMT and a big kick to boot (sub-55 only need apply). Now there’s a tasty battle to take to the big boys in 2012. Superb write up there Sir. The medals were great, but seeing Mo so full of confidence was the highlight for me. Bring on the rest of the world! Well done also to local lad Dave Webb in his second ever marathon – Barcelona looked a bit hotter than Selly Oak. . .
We saw Dave on the tuesday before the marathon, at the uni track. He was doing some long intervals (2k+) and generally getting in the way of Ed and I as we did our sessions of 5k TT and 3x1k respectively. He was extremely focussed (we’ll call it that) and didn’t acknowledge our greetings at all. As opposed to Hannah England and Luke Gunn (who seem to live at the track), and are always really cheerful. But yeah he had a great run in the marathon, second Brit I think. Not bad!